A review of Repercussion Theatre’s summer production. 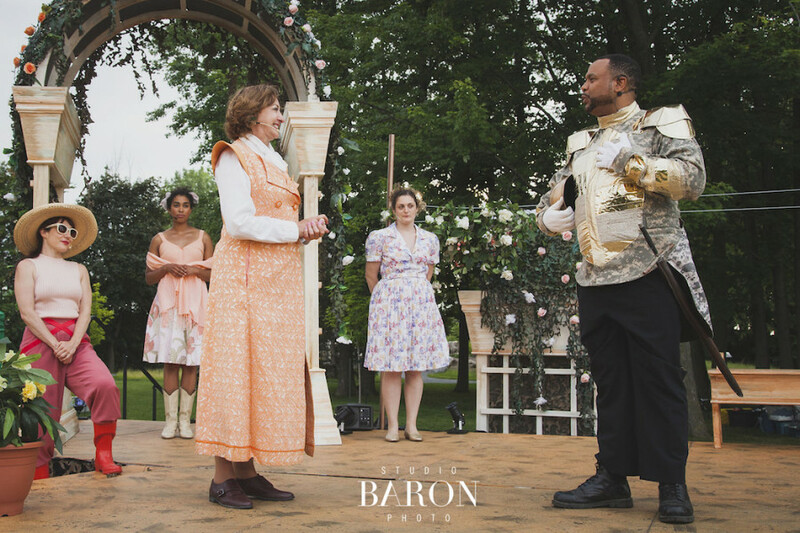 On a hot and sunny July afternoon in Mont Royal Park, I had the pleasure of attending an interpretation of Shakespeare’s comedy Much Ado about Nothing by the Montreal theatre company Repercussion Theatre. For 28 years now, the company has been putting on Shakespeare plays in the local parks of Montreal communities. Thanks to Repercussion’s annual Shakespeare-in-the-Park summer tour, Montrealers can watch beautifully performed theatre in the comfort of their own boroughs. In Much Ado about Nothing, two love stories intertwine over the course of a few days following the return of an army to an estate after a small war. A soldier, Claudio, falls in love with a girl from the estate, Hero, and enlists the help of the general, Don Pedro, to woo her for him. Claudio is then tricked by Don Pedro’s villainous half-brother, Don John, into thinking that Hero was unfaithful to him. Meanwhile, two eternal bachelors, Benedick and Beatrice, engage in a constant battle of wits while the soldiers and the family of the estate trick them into falling in love with each other. Repercussion’s commitment to their Shakespeare-in-the-Park summer tour is both palpable and admirable. Over the course of 33 days, Repercussion’s team built up, performed on and dissembled an entire stage set, lights and all, in 28 different parks both on and off the island. The castmates brought their love of Shakespeare to the stage and it permeated the crowd; though performed in Old English, the actors’ use of body language, facial expressions and comedic timing conveyed Shakespeare’s work brilliantly. While we might not have understood all the words, we knew what they meant. Much Ado discusses and analyzes gender roles, where the two bachelors constantly quip at each other about how women must be submissive towards men and how men must settle down and build a family. By way of witty banter, the characters explore the strict roles that both women and men had to fall into during the 16th century. It also explores issues of trust and regret in love lost. This year, Repercussion’s cast included a lot of current Concordia students and alumni. Dean Patrick Fleming, who played the role of Don John, graduated from Concordia in 1994. Dean has taught at Concordia University and continues to teach at the National Theatre School of Canada based here in Montreal. This summer’s tour is his first return to acting in 12 years after stepping down as the artistic director of Geordie Productions, a Montreal theatre company. Though he was nervous, Dean was definitely excited to flex his acting muscles again. Tiernan Cornford, who played the role of Hero, is currently enrolling in her second year in Performance Creation at Concordia. She professed how lucky she felt to be able to act among others who went to Concordia and went on to have bright futures in acting. Tiernan described the learning process as never-ending, but she also deeply appreciates the chance she got to develop herself both as an actress and as an individual during Repercussion’s summer tour. Quincy Armorer, who graduated from Concordia in 1997, has performed in over 27 productions of different Shakespeare plays. Quincy imbued his performance with an obvious proficiency in Shakespearean theatre. At one point in his role as Benedick, Quincy had to crouch beside the stage and pretend to not be seen as he listened in on a secret conversation. Though he was quiet, Quincy’s expressiveness in his face, eyes and body movements showed the different emotions his character was experiencing, all the while adding the comedic factor by exaggerating all his expressions. If you didn’t get a chance to experience Shakespeare in the park this summer, put them in your calendar for next year. Rare are the chances you will get to have live Shakespeare performed for you in your local park by a crew with such an obvious and complete love for their art.